Electric vehicles are becoming more popular every year. 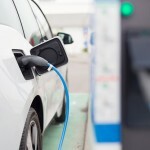 Electric vehicles are becoming more popular every year. They are environmentally friendly, and many drivers favor electric over gas or diesel vehicles because of the amount of money they save on fuel. With the popularity of electric vehicles on the rise, you would think that more and more businesses would be installing chargers but that is not the case. The good news for you is that you can set yourself apart from the competition by calling TriStar Electric today to install an electric vehicle charger on your commercial property. If you have electric vehicle chargers available for your clients, you can brand yourself as an environmentally friendly business. Customers will be more inclined to purchase from you because they will see that you are invested in our planet’s future. Customers with electric vehicles will be more inclined to stay longer because they won’t have to worry about running home to charge their car, and those people will be more inclined to return again and again for that same reason. Business owners installing electric vehicle chargers will create a sort of “snowball effect”. Say there are 2 coffee shops relatively close to one another in a neighborhood, but only one of them has an electric vehicle charger. The shop with the charger is going to get more business because of the added convenience. The one without a charger will eventually follow in an effort to boost their business. Other businesses in that neighborhood would see that the coffee shops are doing well and want to do the same thing for themselves. A conveniently placed electrical vehicle charger can do wonders for your business! This entry was posted on Thursday, February 1st, 2018 at 10:17 pm. Both comments and pings are currently closed.